Connecticut in the fall. There’s really nothing more beautiful. Celebrate the bountiful harvest with a trip to one of the state’s many family-owned farms and expansive orchards for an adventure through a corn maze. The dirt beneath your feet, the corn standing tall above your head—it’s hard to compare to that distinct fall feeling. Here are the best corn mazes in the state. Buttonwood Farm provides families with excellent seasonal fun all summer and fall, first starting with their acres of sunflowers and finishing with their large corn maze. This year, each weekend from mid-September to late October holds tons of family fun with a pick your own pumpkin patch, hayrides, farm animals, a cow train, and a challenging corn maze. During your visit, plan to savor an ice cream from their ice cream bar, opting for a seasonal flavor such as lavender honey, pumpkin, or maple walnut. The Connecticut Trolley Museum offers a fun fall activity that children will love! Each fall, you can ride on a trolley car to their pumpkin patch, where guests can pick one free pumpkin. After returning to the Trolley Museum, you can view the exhibits, take advantage of face painting, or play in the corn box, which is similar to a sand box but filled with corn kernels. This fun event takes place each Friday, Saturday, and Sunday of October. Lyman Orchards is an impressive farm that has been run by the same family since 1741. Throughout the summer and fall, there is an abundance of pick your own options, such as strawberries beginning in June and pumpkins in October. Families can enjoy picking pumpkins and apples throughout October while marveling at the scenic surroundings that are aflame in fall colors. While there, also be sure to purchase one of their homemade pies for a tasty treat. With a pumpkin patch, themed corn maze, hayrides, and beautiful scenery, Foster Family Farm is a great place to visit every fall. Head directly to their pumpkin patch to pick small, medium, or large pumpkins to decorate or carve at home, or take advantage of their economical offer to fill a wheelbarrow for a set price. After selecting a pumpkin, try to find your way through the eight-acre corn maze that has an enchanted forest theme. Make your way through the massive corn maze and into a space with even more fall fun. 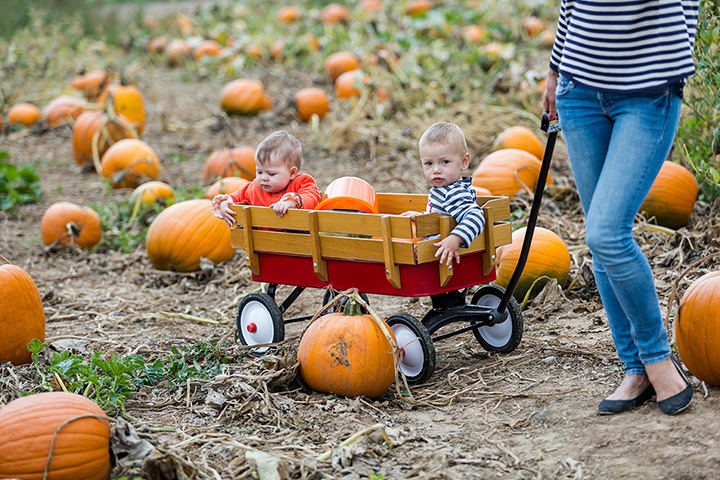 Enjoy wagon rides, snacks purchased from a farm stand, and a pick your own pumpkin patch for a great day out as a family. If you don’t feel like going through the maze or picking your own, the farm store sells a selection of pre-picked pumpkins that will be perfect for your jack-o-lantern. Pick out your perfect pumpkin at Rose’s Berry Farm, which is an excellent pick your own farm with varying treats throughout the summer and fall. Pick one of their pumpkins to carve at home and use the sweet fillings to cook your own homemade pumpkin pie or flavorful pumpkin dessert. If you don’t have time to pick your own, Rose’s Berry Farm also has a farm stand full of their fresh produce and products. A family-owned farm since 1666, the Pickin Patch currently offers a variety of pick your own fruits and vegetables as well as a garden center. One of their cool fall offerings is a hayride to their pumpkin patch, where you can pick your own. During your visit, also check out the festive fall decorations and late flowering plants to brighten up your home and garden. The lovely Silverman’s Farm offers pick your own fruits all summer long and into the fall season. Celebrate October Fest by picking your own pumpkin in their pumpkin patch or choose colorful squashes or gourds for fall harvest table décor. During the weekends, there are several events with live entertainment, food vendors, and face painting, so try to schedule your visit to coincide with one of these events. You can also enjoy tractor rides through the orchard. On weekends from September through October, head to Scotts Yankee Farmer to pick your own pumpkins and apples after enjoying a wagon ride. Be sure to charge your phone before visiting because you’ll certainly want to photograph the picture-perfect fall views to share with your family and friends on Instagram. Scotts Yankee Farmer also offers an excellent CSA program of their produce. Have fresh pumpkins and apples all through the fall by picking your own at Whittle’s Willow Spring fall in the scenic town of Mystic. And if you don’t feel like picking your own, you can opt to select pre-picked pumpkins from their fresh farm stand. Throughout the summer and early fall, there are also pick your own peaches and a great farm stand with corn, Brussels sprouts, eggs, and other fresh goods.